Florida Senator Marco Rubio addressing the Conservative Political Action Conference last year. But a year later, the Cuban Commission for Human Rights and National Reconciliation, a dissident watchdog group, reported there were as many if not more political prisoners in Cuba than there’d been before Bush’s order. For half a century the U.S. followed that cycle: Washington tightening the embargo. Then Havana tightening the screws. Wash. Rinse. Repeat. Yet this week – only a year after President Obama halted the loopy loop and reestablished diplomatic relations with Cuba – his opponents are furious at him for not improving Cuba’s dismal human rights situation. Never mind that they were always hush-hush a year after any embargo squeeze – when they looked across the Florida Straits and saw the revolution was still thumbing its nose at them. On this week’s first anniversary of re-opening embassies in Washington and Havana, they’ve declared engagement with Cuba a flop because it hasn’t achieved in 365 days what isolating Cuba couldn’t do in 55 years. I guess I missed the part where NOT having a U.S. ambassador in Cuba compelled its communist government to hold multi-party elections, free political prisoners and greenlight an independent press. It takes Florida Senator Marco Rubio. The Cuban-American Republican chose Wednesday, the actual anniversary of restored diplo ties, to denounce Obama’s Cuba normalization policy and double down on his crusade to block the posting of an actual U.S. ambassador in Havana. “A U.S. ambassador is not going to influence the Cuban government, which is a dictatorial, closed regime,” Rubio told Politico. I try to keep on top of things. But I guess I missed the part where not having a U.S. ambassador in Cuba compelled its communist government to hold multi-party elections, free political prisoners and greenlight an independent press. I missed the part where the embargo made the Castro regime cry uncle instead of gifting it a perennial scapegoat for repression and mismanagement. I missed the part where unconstitutionally banning U.S. tourist travel to Cuba shamed the government in Havana – instead of making Washington look as heavy-handed as Havana. 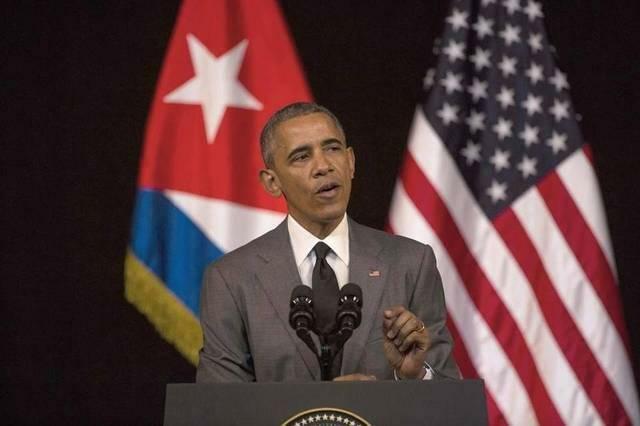 Could Obama do more to cajole Cuba on human rights? Yep. Still, folks who support normalization – meaning, most Americans – don't dismiss the fact that Cuba is still locking up dissidents. They don’t ignore the Cuban Commission’s latest report that short-term political detentions are up this year. At the same time, they didn't expect normalization to open every cell door on the island overnight – which is the disingenuous double standard foes like Rubio have been holding it to. And they realize engagement has shown signs of getting under the regime’s skin in ways isolation never did. President Obama delivering his speech in Havana in March. As Commission founder Elizardo Sánchez pointed out to my colleague Andrés Oppenhemier in the Miami Herald this week, Obama’s historic visit to Cuba in March unnerved its revolutionary dinosaurs. Why? Mainly because the speech – which directly challenged Cuban President Raúl Castro to embrace more political and economic reform – was delivered vivo y en directo. Live and in person. And that’s engagement’s chief long-term advantage over isolation: It gets up in comunismo’s face more effectively than any embargo edict issued from the White House or Little Havana does. That puts the U.S. in a better position to influence change in Cuban once the dinosaurs pass away – which is the actual, realistic rationale behind normalization. No, he doesn’t. Otherwise he’d step out of the way and permit a U.S. ambassador in Havana. But he’s trapped in the Cold War loop. I’m waiting any moment now for Marco Rubio to demand that President Obama recall our ambassador to China and shut down our embassy there.